The first marathon race was conducted in Japan in 1909.The Mainichi newspapers in its articles had introduced races that had been held in Europe and America. Then on March, 21 they hosted a race which was to be the very first marathon race held in Japan. The course stretched out from Kobe to Osaka. In 1912, Japan sent a marathon runner to the Stockholm Olympic Games and it cemented the popularity of the marathon in Japan. In 1946, just after the end of the war, a race was conducted in hope of encouraging Japanese people to reconstruct the nation. The Mainichi Newspapers and Japan Association of Athletics Federation organized the Mainichi Marathon which was held on October 20 1946. Sixty three athletes participated in the race on a course laid out in Osaka. Since then the race has been held annually and has constantly served as a qualifying event for major championships such as the Olympic Games, World Championships in Athletics, the World University Games, and Asian Games. The race invited the gold medalist of the Rome Olympic Games, Abebe Bikila of Ethiopia. The swarm of general public, eager to see the medalist, surged into the road side and that caused a big traffic jam. Abebe Bikila overcame the difficulties and won the race. The venue was relocated to the city of Otsu in the Shiga prefecture because of the traffic problems during the previous event in Osaka. The race was held in Tokyo with the intention to have it operate as a test race for the Tokyo Olympic Games that were to be held in the following year. The race was held in Tokyo again and served as a final qualifying meet for the Japanese Olympic Team and a rehearsal race for the Tokyo Olympic marathon. The race returned to Otsu. Abebe Bikila, the gold medalist of Tokyo Olympic Games, was again invited. Spectators were estimated at 200,000. Bill Adcocks of England was invited and won the race with a new course record of 2:13:46. Frank Shorter of the US was invited, won the race at 2:12:03 and lowered the course record again. Two-time Olympic marathon medalist, Karel Lismont of Belgium was invited. Japanese twin brothers, Takeshi and Shigeru So, were invited and placed first and third, respectively. 104 athletes participated, the greatest number to that date. The race title was renamed the Lake Biwa Mainichi Marathon. Participants more than doubled to 231. Athletes from Asian countries like India and China were invited in order to promote the sport in the region. This project continued till the 41st race. 313 athletes participated. The race served as the 1st Asian Athletics Championships men’s marathon race and is the final selection race for a Japanese men’s marathon team for the Seoul Olympic Games. Toshihiko Seko of Japan won this race and secured an Olympic berth. Belgian Eddy Hellebuyck’s skillful tactics earned the victory. It was the first time in thirteen years for a foreign athlete to win Lake Biwa Mainichi Marathon. The race was held in Hiroshima in order for it to be a rehearsal for the Asian Championships men’s marathon to be held in the city in the following year. The race returned to Otsu. The wife of Mr. Bikira Abebe was invited to the commemorative ceremony. A university student, Yuji Nakamura of Japan, won the race. Joaquim Pinheiro of Portugal won the race with the new course record of 2:09:32. The winner of ’95 World Championships, Martin Fiz of Spain, won the race with a time of 2:08:05, a course record and the fastest time in the world that year. A university student, Atsushi Fujita finished 2nd to Martin Fiz with a time of 2:10:07, breaking the 20-year old Japanese university record of Toshihiko Seko. Mr. Fujita went on to become Japanese record holder. Antonio Pena of Spain won the race at 2:07:34, making the course record that has not been broken up this date. A Japanese athlete, Ryuji Takei, won the race with the best Japanese record of the year at 2:08:35. The last Japanese won the race was four years before. Japhet Kosgei of Kenya won the race. 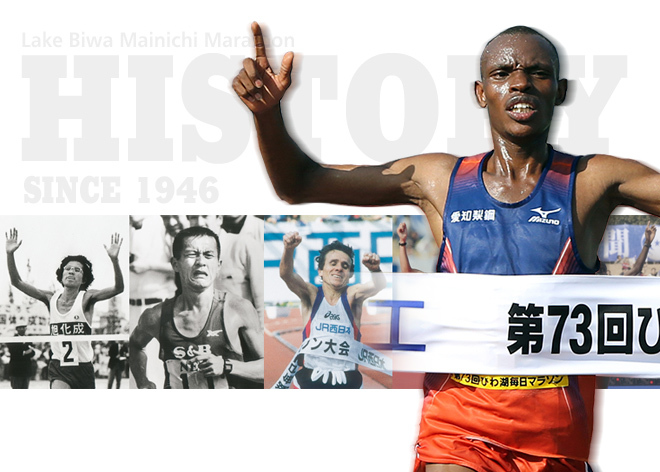 First Japanese to finish was Masakazu Fujiwara, making his debut at the marathon. His time of 2:08:12 was the best Japanese record made by athletes who completed their first marathon. After winning the silver medal in the World Championship in Athletics 2007(Osaka), Mubarak Hassan Shami of Qatar won the race with time of 2:08:23. First Japanese to finish Satoshi Osaki won the third place in a personal best 2:08:36, was elected as the representative of the Beijing Olympics. Former world record holder Paul Tergat of Kenya, who was participating in his first race in Japan, achieved the victory of dignity. Wilson Kipsang of Kenya won the race with the new course record of 2:06:13. After 26km, he broke away from the leading group of 13 runners, and with a difference of more than 3 minutes from second place, he achieved the victory with a world class performance. Japanese athletes, Hiroyuki Horibata finished in third place with 2:09:25, and in 4th Kentaro Nakamoto, they became the representative Japanese runners of the World Championship in Athletics 2011 (Daegu). Fighting against rain and cold weather, Japan-based Kenyan, Samuel Ndungu gained victory in his debut marathon with a time of 2:07:04. The first Japanese competitor to finish, Ryo Yamamoto achieved 4th place with an incredible personal best of 2:08:44, and he worked hard to beat Kentaro Nakamoto, who took 5th, with a mere 400m remaining. Following these excellent performances, Yamamoto and Nakamoto were selected as representatives at the London Olympics. Vincent Kipruto, winner of the silver medal at the World Championship in Athletics 2011 (Daegu), attained first place with a time of 2:08:34. The first Japanese athlete to finish, Masakazu Fujiwara, managed to achieve 4th place, just 17 second behind the top. He became a representative Japanese runner at the World championship in Athletics 2013 (Moscow).The other athletes, Suehiro Ishikawa and Kohei Matsumura earned 6th and 7th position respectively. Bazu Worku of Ethiopia earned his first victory with a time of 2:09:10, under sunny and windy condition. Satoru Sasaki, the highest placed Japanese competitor, achieved second place in 2:09:47 with his PB. Last year's champion, Vincent Kipruto, finished in 4th place, while Yuki Kawauchi took 5th. Rui Yonezawa was presented with newcomer of the year award. Due to severe weather conditions, in which it rained all day, runners developed slower pacing than usual. The winner, Samuel Ndung from Kenya achieved his second victory, with the time of 2:09:08. Italian, Daniel Meucci came in second place, with Mongolian, Ser-od Bat-Ochir taking third place. The fastest Japanese runner was Kazuhiro Maeda, who obtained the fourth position. They were subsequently selected as the representative athletes for their countries for the IAAF Championship in Beijing 2015. The race was held under the difficult condition which the temperature got up around to 20°C, and Lucas Rotich (Kenya) captured the victory with a time of 2:09:11. Hisanori Kitajima (JPN) finished in 2nd place with a time of 2:09:16, and elected to represent Japan in the Rio Olympics together with Suehiro Ishikawa (JPN) who got the 4th place. Copyright (C) THE MAINICHI NEWSPAPERS. All rights reserved.